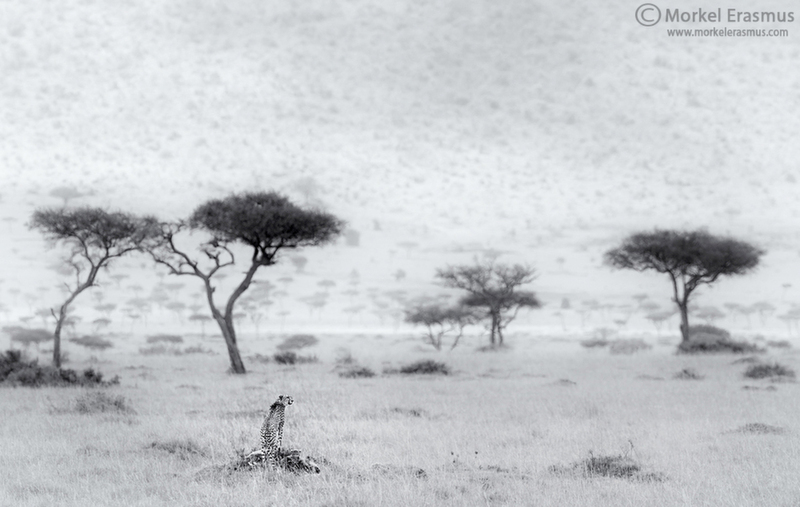 Who said you can't create "animalscapes" with a 500mm lens? From the Mara Triangle a few years back. I had to spend a little while to appreciate the vast distance captured from foreground to background in this animalscape. Pretty cool. The leopard is perfectly positioned in the scene as a focal point. The monochrome treatment is effective. Beautifully done, Morkel! Is that the escarpment in the distance? I was confused at first, as I thought it was sky full of little clouds but on second thought I think its land and trees right up to the top? The Cheetah is certainly the star of the show, and the feel of the vast plain is quite tangible when looking at this amazing view. Well done! Yes, Carol - it's the Oloololo Escarpment in the Mara Triangle! There are actually 4 cubs around the mom on the mound but not visible on this image. Lovely shot Morkel, I like it with a bit off the top as well.